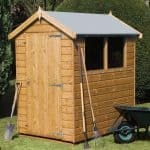 The Hartwood 8′ x 6′ Premium FSC Overlap Apex Shed is a well made and classic looking shed that is going to give you a secure and very well designed place to keep your items safe and sound. This is a shed which is able to handle even the heaviest items thanks to the premium solid board flooring that is inside it. The high and wide single door and the two shatterproof styrene windows are not just practical features, but they add a bit of personality to the shed as well. 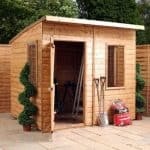 The storage space that the shed offers is rather decent and the general size of the shed is ideal for those of you who do not want a garden taking up all the room that you have in your garden. The floor is not the only thing about this shed that is very high quality. The rest of the shed is equally as impressive as that premium flooring. The frame of the shed is very strong and connects securely to the overlap cladding to make this a very robust shed that also offers no way for water to get inside. The apex roof is not just there to be a pretty feature of the shed it is made very well also. The green mineral felt is very heavy duty and along with the solid sheet boarding underneath it, is going to keep the rain out. The size of the Hartwood 8′ x 6′ Premium FSC Overlap Apex Shed makes this the kind of shed that is ideal for those of you who want a shed that can store a lot of items, but not take over the whole garden and families who need a space to keep the kids outdoor toys, bikes and perhaps even the kids when they are getting on your nerves. This is actually bigger than the pictures suggest, as the width is 6 feet 8 inches and the depth a very spacious 7 feet 11 inches. This is a lot of floor space and with the help of some shelving, you can really make this go a long way. The shed offers a very impressive amount of headroom along the ridge at 7 feet. The roof is something that we feel they really did a great job with. They used solid sheet boarding which we know is not the most easy on the eye boarding, but it is strong and that along with the heavy duty, green mineral felt is going to really look after your belongings and keep the rain flowing off the sides of the shed. The wall cladding is something that we really like as it gives the shed a very old school kind of style. They have gone for 8 mm thick overlap cladding and this kind of cladding we can happily tell you will do just a tremendous job in keeping the rain out. 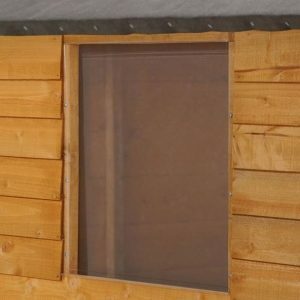 That overlap cladding is joined very securely to the 28 mm x 28 mm frame, which not only helps make the shed watertight it also makes it a very robust and long lasting structure. We really like the design of this frame and we are sure that even though it is a good size and strong, will not stick out too far and eat into your storage space. The flooring is why this is classed as a premium shed. Rather than use the same solid sheet boarding that is used for the roof, solid boarding has been used and let us tell you this can take just a crazy amount of weight. If there was a double door on this shed then we are sure you could probably drive a tank in here and the floor would happily take it. The strength of this floor makes this the perfect shed if you have heavy items you want to keep safe. Once you have installed the shed, within a few weeks, you will want to give it a coating of wood treatment to protect that wood from rot and decay. Unfortunately this is not a onetime thing as you will need to give it a fresh coating once a year. To be fair this is not a big deal as this is the case with most sheds, but it is important you do this or rot may start to appear. As long as you treat the shed on a regular basis, you will be covered by a ten year guarantee that protects you against rot. One the front of the Hartwood 8′ x 6′ Premium FSC Overlap Apex Shed, we have a single door. Now this may be a single door, but we are sure that you will not have any trouble getting things in and out of the shed thanks to the generous width of the door. As you can see from the picture the hinges that are used to keep the door in its place have a great look to them and they are actually also very strong. The windows on the side of the shed are something that we really like as they are made from styrene and are 1.25 mm thick. This type of material does not smash easily and even if you have it so the sun is always beating down on the windows they will not discolour as time goes by. It was nice to see that there was a pad bolt on the door, rather than a simple turn button. If you are not keeping anything expensive in the shed then this pad bolt is more than enough. But if you do have items that are a little pricy then you should look into adding a lock. The shed does offer more privacy than you would think as both windows are located on one side. Still if this is not enough and more privacy is something you want then add some curtains or blinds and then you will be fine. This is a shed that we feel would look just as great in any colour. So do not just look at the more traditional light and dark brown wood treatments. Get a bit creative and have a look at some of the more brighter and extravagant wood treatments that are out there. If you do not want to use a padlock from your local pound shop, then they do offer a more high quality and pretty awesome looking, hasp and padlock set. This is Yale branded so it is high quality and worth the £19.99 price tag. 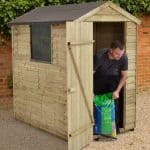 For those of you building the shed on a surface that is not 100 percent solid or is a surface that you are just a little unsure of, then they do offer a plastic shed base at a cost of £119.99. This is one very solid shed that is high quality in just so many ways. They really have done an impressive job on this shed and from top to bottom, we are happy with the design. We see this as a shed that if you do treat it right, is going to be a shed that you get a lifetime of use out of. 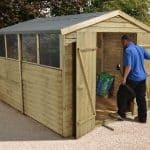 The materials used are very long lasting so you are certainly going to get many years out of this, but you must remember that treating the shed is your responsibility. 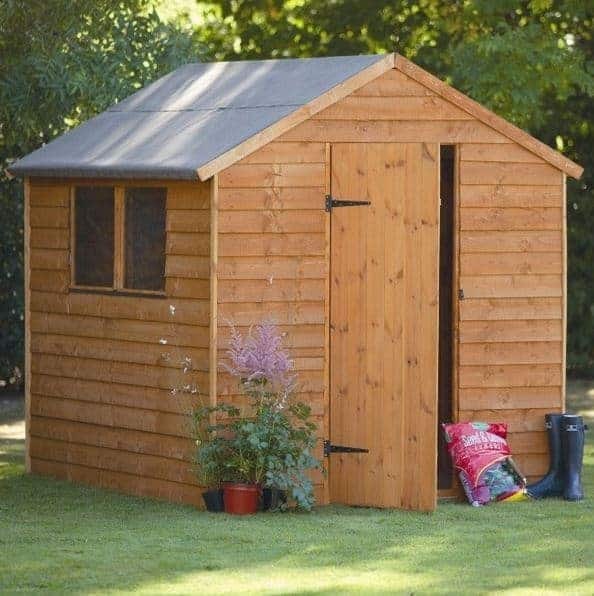 As far as mid sized sheds go, this one is a little bigger than the norm so you do have a decent amount of storage space to play with here. Take your time and follow the instructions, then you and the person you get to help should not have any trouble installing this. 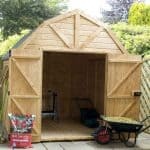 This is a shed that we really do like, but at just a hair under £350 the price is certainly a little high. But you must remember the reason for this is the strong and solid flooring that is designed to take a lot of weight. Final Thoughts: The Hartwood 8' x 6' Premium FSC Overlap Apex Shed really is a great shed. It has a very old school kind of design which is very charming. The shed is also of a size that would make it something even more modestly sized gardens can enjoy. In general this is a shed that we really like, The shed with its strong, premium flooring is certainly aimed towards those of you who do have heavy items that would really push regular flooring to its limit. 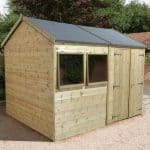 We know that £349.99 may seem on the high side and to a degree we would have to agree, but if a strong floor is something you must have then you will struggle to find a better shed.